I know, the Westchester Breakfast Club is doing all sorts of crazy things lately–first, breakfast last Monday in Manhattan. Now, breakfast on a Sunday. What can I say, we’re a crazy bunch. Breakfast Czar Sylvia was unable to join us today, so Pat, Jeff, and I gathered at the Wobble Cafe, a small, family-friendly establishment on Campwoods Road in Ossining. Wobble exudes “familyness”, from the corner in the back with toddler-appropriate toys to the crayon-colored pictures taped on the walls. Needless to say, we were expecting Wobble to be packed with parents and their children on a Sunday morning, so we decided to arrive on the earlier side. When we got there at around 9:30, though, only one other table was occupied. The place didn’t start to really fill-up until about 10:15 or so, but then it filled up quickly. There were people at every table by the time we left at 10:30. Wobble is cozy, with subdued lighting, warm red walls, and large windows at the front. For those wanting just a quick bite, there’s also a small counter. After meeting Pat and Jeff at a table in the back, I was informed that they had already ordered a breakfast appetizer: donuts. Wobble calls these “Frats.” I’m not sure why, but it doesn’t really matter because whatever you call them, they were delicious. 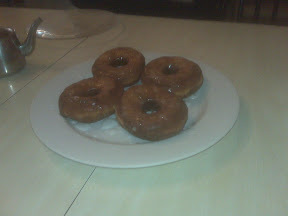 Presented on a lovely glass plate were 4 warm, crispy, glazed-to-perfection donuts. I’m not typically a big fan of donuts–I often find them too heavy for my liking–but having been freshly made, Wobble’s donuts maintained a lightness that other donuts typically lack. This was a treat, a nice, if sugary way to start our meal. Up next was the main course. 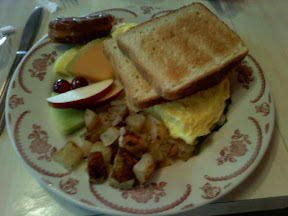 I had an omelette with cheddar cheese and fresh spinach, sides of home fries and fresh fruit, and white toast. The omelette was delicious–wonderfully fluffy, with the cheddar and spinach encased inside. The flavors of the cheddar and spinach blended well together. The homefries were small cubes of potatoes, not too greasy. They were also not especially seasoned, but if you remember my review of The Patio, you’ll also remember that underseasoned home fries is not a problem for me. The fruit was a pleasant mix that included some apple slices, red grapes, pineapple, and melon. I wound up wasting my toast–it was perfectly fine, but I simply had no room for it after my one-and-one-third donuts…er, Frats. Plus the butter was little foil packets that were left on the table for too long, making the butter a bit of a mushy mess. The service was prompt and attentive, the food came out quickly, and the price was reasonable–my meal, including my contribution toward the donuts, a glass of skim milk (which, I should note, came with a free refill), and tip came to about $12.50. Wobble offers good food, a pleasant, laid-back atmosphere, and reasonable prices, making it a local eatery worth returning to. The details: Let’s talk about the good first. We arrived at 9:30 on a Sunday morning. I assumed the worst; we’d be competing with a dozen rowdy kids and their parents for tables and service. I was pleasantly surprised when we arrived there and were immediately seated in a relatively empty restaurant that only started to fill up by 10:15 or so, right as we were about ready to leave. Also good: the frats – freshly fried, lightly glazed donuts made to order and served wonderfully warm. I anticipated their being slightly smaller than an average donut, but again I was surprised and delighted by the size (just about the same as Dunkin’ Donuts, with a little more weight to them). Now, the not so good. It’s not that the Bananas Foster (bananas in rich syrupy/whiskey sauce that’s burned down wrapped in a crepe) was bad. 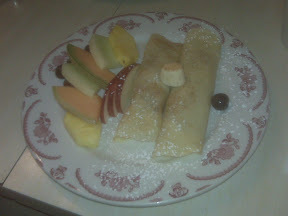 The crepes were pretty well made, the sauce was good enough, and it was served with a generous proportion of fresh fruit. The problem was that all of the subtlety of the flavors was completely overwhelmed by the bananas. At the end, it just tasted like overripe bananas. I’ve been to Wobble Cafe before, and I really enjoyed it (the hash browns are wonderful) but this dish was a disappointment. A tried and true place to go for breakfast. The atmosphere is homey, with little children running around having fun. It’s very much a family-oriented establishment. Migas are my go to meal. If I had to explain it, it’s a pile of egg, chorizo, cheese, and bits of soft and hard tortilla. All of this is served with pickled peppers and your choice of fruit or home fries. I love potatoes, so I always get the home fries. 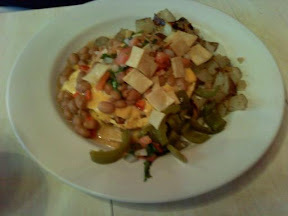 Don’t worry; there is the option for vegetarian migas. I’ve never tried it because, well, meat is delicious. The meal doesn’t look pretty, but it’s delicious. It’s just a pile of goodness. Another thing that was on the brunch menu were the Frats. They’re the Wobble made-to-order donuts. They’re not on the regular breakfast menu, which is sad, but they are fantastic. They arrive nice and hot, fresh from cooking. Your first bite breaks into the perfectly cooked dough that’s drizzled with just the right amount of liquid sugar frosting. I have been to Wobble before and something that’s on the menu that deserves honorable mention is the bacon. The bacon is from some local farm upstate and it’s pretty fantastic. All in all, Wobble is a great place to go and I’ll be sure to visit often.